The railroad industry is replete with specialty machinery used in the repair of locomotives and rolling stock. FMW has the equipment, facilities, and expertise to tackle all manner of specialty machinery repair and overhaul. The following provides a brief overview of our services. The various components of railroad drop tables undergo significant wear and tear over their lifespan. In particular, the lead screw and jack screw of many common drop tables wear out periodically due to use. FMW solutions is equipped to repair and/or fabricate from scratch these key components to keep your drop tables in safe, reliable service, including "ACME" trapezoidal screws. Transfer tables and turntables are specialized pieces of equipment that are often approaching, or exceed, a century in age. FMW has the mechanical experience and facilities to undertake the complete overhaul of critical components of these systems. This includes main bearing re-manufacture, bogie wheel and journal repair, spindle re-manufacturing, and other repair services. Maintenance-of-way (MOW) equipment is subjected to some of the harshest wear and tear on the railroad. Dust. Vibration. Stress. All of these, combined with long duration work blitzes, results in equipment and components that require re-manufacturing. 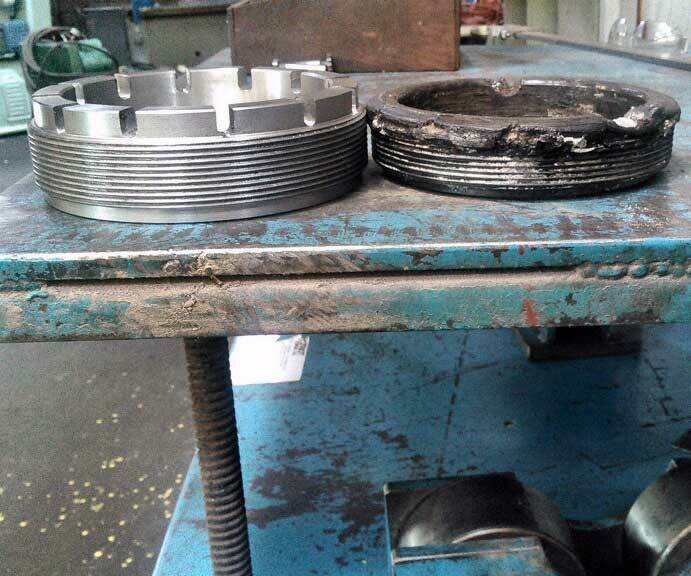 FMW has the capacity and capability to handle MOW equipment component repair and overhaul.